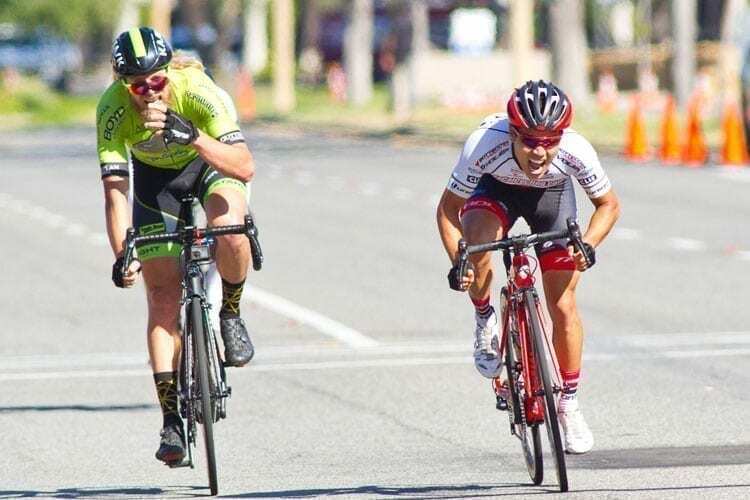 The Barry Wolfe Grand Prix is a criterium race that is quite local to me. It’s once in a blue moon when I can commute to a race on my Bottecchia bicycle! The SoCalCycling.com Team had a total of 6 riders. 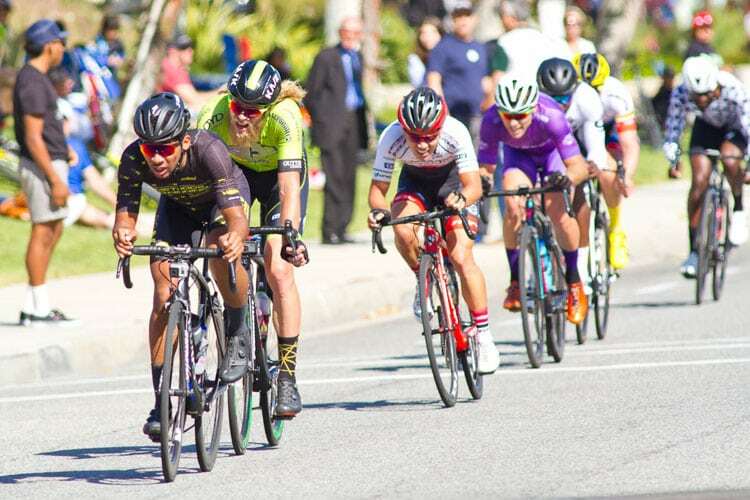 Ex-Pro Sergio Hernandez (SoCalCycling.com Team), started off the 80-minute criterium with the first attack. This allowed us to see the reaction and the dynamic of the field. After almost a full lap, the attack was neutralized and a counter attack went. 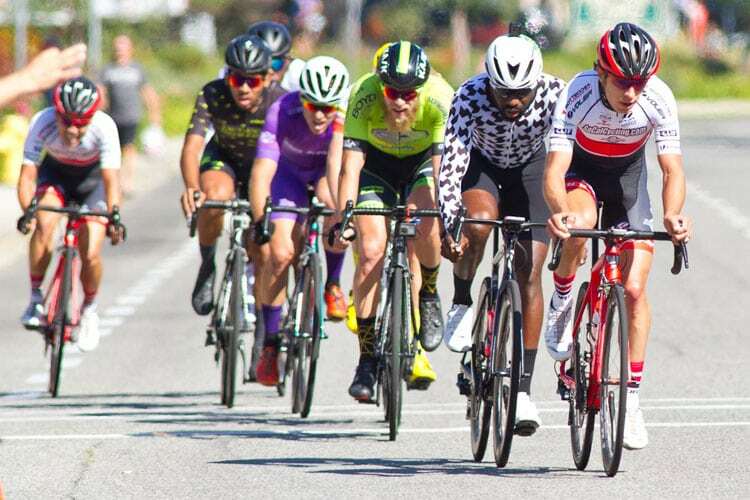 This break contained Ben Foster (SoCalCycling.com Team), Justin Williams (Williams Racing), Tyler Locke (Support Clean Sport/Guttenplan Coaching), Cameron Bond (Go Fast – Incycle), and Dante Young (ENDO CONCEPT TEAM). With the gap increasing significantly. I was in the proper position and had some momentum, so I used that opportunity to attack into the last few meters into the headwind. I successfully bridged across and now Ben Bertiger, Noah Schlosser, Frank Sarate and Sergio from the SoCalCycling.com Team would now follow the moves and shut every attempt of a bridge down. Roughly 20 minutes later, two other riders slipped away from the field. Imeh Nsek (M2W Academy Team) and Edgar Stepanyan (Velo Pasadena) attempted to bridge across. As we still had over 1 hour to go left in the race, Justin Williams went back to the group of two to help them bridge across. Once lap cards showed 5 to go and with over a 1+ minute gap. This allowed for countless attacks and counter-attacks. Eventually, the winning move saw Imeh ride off solo with everyone hesitating and looking at each other. Numerous attacks went off afterward, but none stuck except Edgar’s move rode off for 2nd. Coming into the closing laps, Justin and Dante attacked with Ben chasing them down. Tyler sat behind Ben and Tyler opened up the sprint from 400 meters. It was certainly a long hard dragged out sprint. I was able to pop around him in the final meters for 3rd. Thanks to the Race Promoters and Volunteers for putting a great event. It’s always a great feeling doing a race that is so close and local to many of the riders nearby! 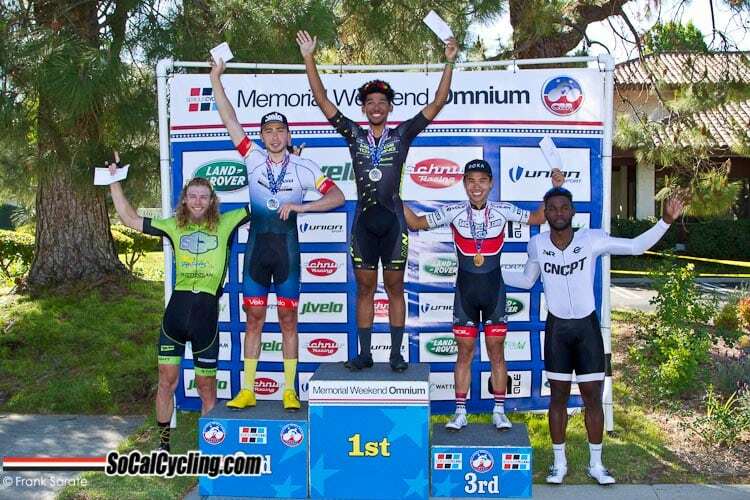 And thank you to my SoCalCycling.com Team Sponsors for the continued support: SoCalCycling.com, Jenson USA, Bottecchia, Voler Apparel, Clif Bar, FSA, Gizmo Cycling, Union Sport, Hyundai San Sebastián, ROL Wheels, TRP Brakes, Caravan Canopy, KMC Chain, Bell Helmets, Echelon Design, ROKA, Larsen’s Restaurants and SCC Slick Chain Lube.